We moms are easy targets. We are exhausted, weary, emotionally and physically drained. (Half of the time I feel like I’m wearing an actual target on myself, making it really easy to be taken out.) We have an enemy who wants to keep us defeated and beaten down. He wants to put our attention on things that don’t matter or on lies that keep us from abundance. If he can keep us believing that survival mode is an okay place to be, his work is done. We will become complacent, and he can move on to his next victim. Not only are we in a battle for our own hearts, we are also in a battle for our children’s hearts. As moms, we are raising up the next generation of Christ followers. The enemy will do everything he can to bring us down so that we are distracted from pointing our kids toChrist. You might be tempted to read this scripture about the armor of God and tell yourself it doesn’t apply to you, that it is meant for someone stronger or braver. I admit that I used to skip over this passage because, as a girly girl, I just didn’t relate. After all, aren’t men supposed to be spiritual leaders in the home? I figured that God had called my husband to engage in any heavy lifting spiritually, so I was off the hook. 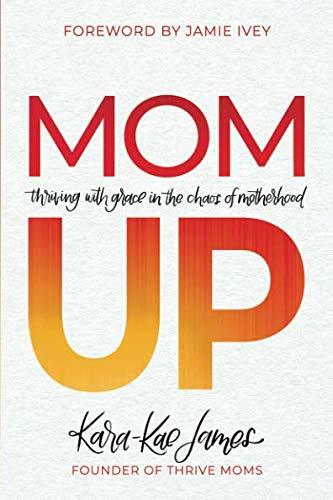 But when my illusions about motherhood were shattered, and I asked God to show me how to thrive, I went to His Word and started listening to what it says. And guess what? God sees both men and women as warriors—and in this passage in Ephesians 6, He is telling us exactly what we need to do in order to thrive despite being in a battle. He instructs us, every morning, before our feet hit the floor, to suit up. Instead of slapping on a label of your choosing, put on the full armor of God so that you can go to battle for you and your kids. We try to take up our own armor because we think we can face the enemy on our own. (Guilty, party of one!) I find myself suiting up every morning, but too often it’s with my specially crafted DIY suit of armor, because I assume God, obviously, didn’t make His armor one-size-fits-all. My armor consists of a sword of my own strength (fueled by coffee), a belt of insecurity, a shield of pride, shoes of perfectionism, and a helmet of sarcasm. But it is impossible to take on the enemy in an armor of our own design. Only God can prepare us for the battles we face. As moms, we can and should be gentle and nurturing. But God sees us as more than cooks, housecleaners, and chauffeurs. We are warriors! We have to toughen up, suit up, mom up, and be prepared for what comes our way.